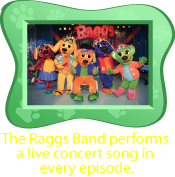 Raggs is a musical & educational preschool series starring five colorful canines. They are not your average dogs - they're also talented musicians who make great rock 'n' roll music as The Raggs Band. 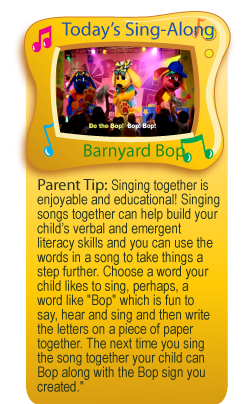 With over 200 original songs, the power of the music & humor stimulate children to become actively involved in learning. Raggs introduces children to elements that span the preschool curriculum, working to nurture their sense of self & others, and to foster a strong motivation to learn and achieve. Each show also focuses on the development of social and emotional skills, and models cooperation between friends. The format is innovative and contemporary in its ability to knit together and reinforce a single theme through the use of various segments: live action clubhouse segments, animation shorts, music videos and interviews with children by the band's wisecracking pet cat, Dumpster. Interactive studio concerts featuring real-life fans and a "Wag & Wiggle" dance segment promote movement and physical fitness -- adding another dimension and heightening the entertainment value.